Moneylife Foundation was set up in 2010 to and is engaged in spreading financial literacy, consumer awareness and advocacy and works towards safe and fair market practices through workshops, roundtable meetings, white papers, research, awareness campaigns, grievance redressal and counselling. The foundation also conducts daily guidance sessions every evening at Moneylife Knowledge Centre to offer free counselling to people on a wide range of issues like co-operative housing society, property, RTI, consumer-related and insurance matters. Moneylife Foundation’s RTI Centre is a project started with an aim to bring transparency and accountability in the governance and administrative system of the country. 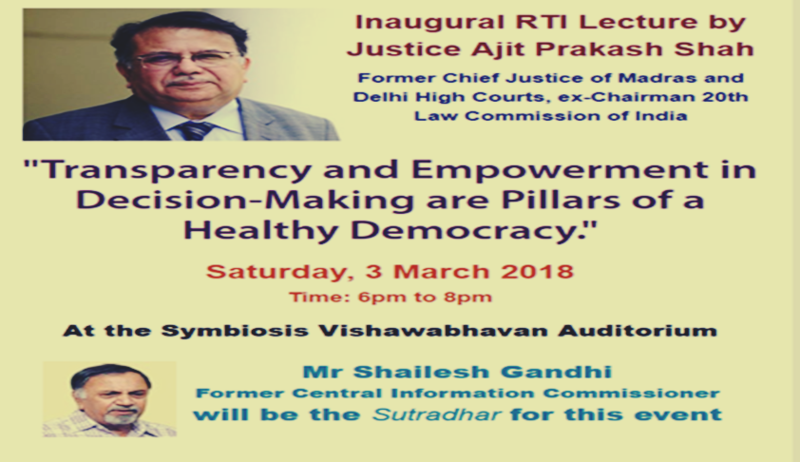 Moneylife Foundation's RTI Centre is organising its inaugural RTI lecture by Justice (Retd) Ajit Prakash Shah, former Chief Justice of Delhi & Madras High Courts and Ex-Chairman, 20th Law Commission of India. Entry is free but registration is mandatory. Alternatively, you can also register on 022-49205000 or email foundation@moneylife.in or call/SMS/WhatsApp on +91-7045156415 to register your name, email ID & contact number. For any queries, contact Vinita Deshmukh (9823036663), or Shrikrishna Kachave (8796655413).